When sadness overcomes every other emotion and makes it harder to live, we can only do one thing, and that is expressing that sadness in some way. Some express it through songs, some write poetry, and some write quotes about it. Following are some lines, quotes, and messages about sadness. The love that never replies back hurts, but lovers gone strangers are the worst. You just cannot erase their memories like pictures on the phone; they stick with you forever. The sadness in love comes in so many ways. Following are some lines about love and sadness. I loved you, despite your flaws, and you left me without any reason. Now I still love you, and that makes me sad. You were the reason for my happiness, and now, you are the only reason why I am hurting. It was clear that I did not mean much to you, and the saddest part was my hope. The longer I hoped, the sadder it got. All I ever knew was you, all I ever wanted was you, you were my whole world. All I got is your ghost. My love for you was real, and that was what you needed, but he gave you what you wanted, so you chose him over me. I want you to come back and tell me you love me, hold me and kiss me. But I know it is not going to happen. And I know it does not matter what I want, it never has, and that is just sad. 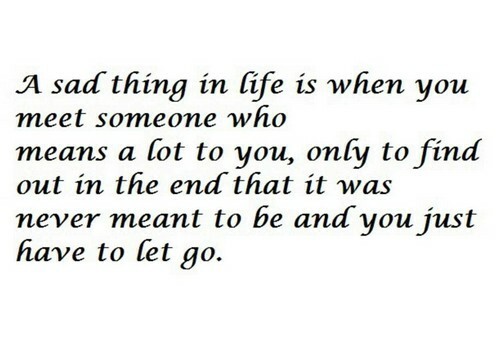 And the saddest part is I cannot do anything about it. Sometimes I wish I would have told you about my love for you before he had. I think the timing was wrong or maybe you were never my fate. It is just a sad waste of love. They say that time can heal; it just does not. 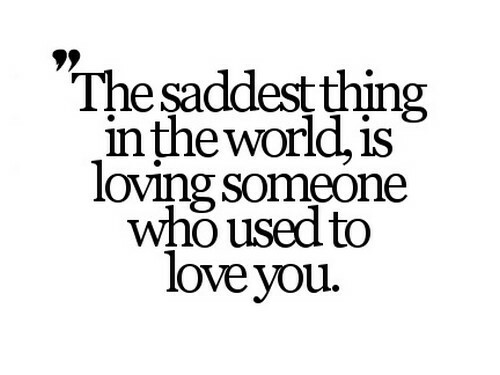 It only makes us used to the pain, and that is just plain sad. When you were mine, the chaos of this world never really bothered me. Your kiss was enough to make me forget about every problem in my life. Now, all I am is sad, and all I can do is wait for this world to crush me with its burden. It is hard to lose love, but that is not the end of the world. You are allowed to feel love again, and you are allowed to live again. Take your time, but do not take forever. Though your love makes me sad, it also empowers me. It makes me feel special. I experience something so beautiful with you that I want to do it again and again. Now that I know how beautiful love is, I want to experience it again. I do not want it to be a blurry memory; I want it to be a moment to be in. 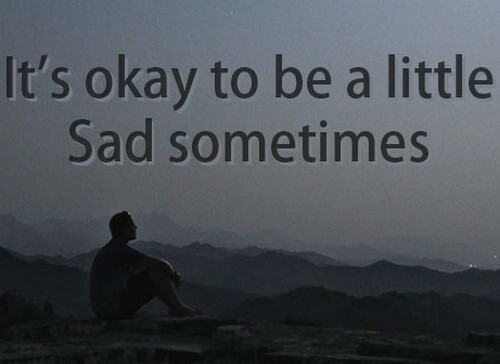 Being sad after a breakup is okay. You are allowed to sleep in; you are allowed to cry, you are allowed to be quiet. But just make sure that when you are ready to move on, you are ready to leave everything behind, and even when it comes up in future, you are ready to face it. 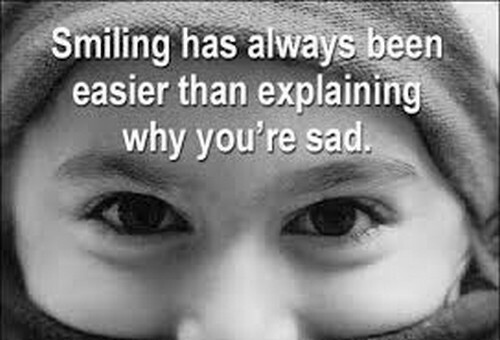 The hardest part of being sad is when you have to wear a smile on your face just to be socially acceptable. Just so people will not call you a drama queen or an attention seeker. I want to forget you, but it sad that I cannot. Yes, you hurt me, but you also gave me so many good memories, and I do not want to let those memories go. I want to get rid of this sadness, but I also want to appreciate the good memories that we created together. You were the only good thing in my life, now I am back to sadness and emptiness, as I was before meeting you. I never thought that the person I love the most would be the reason of my hurt and sadness. Love made me feel so many things, and sadness is one of them. You promised everything but you leave me with nothing. Sometimes life knocks you down, and it is very normal to feel sad about it, but not for too long. 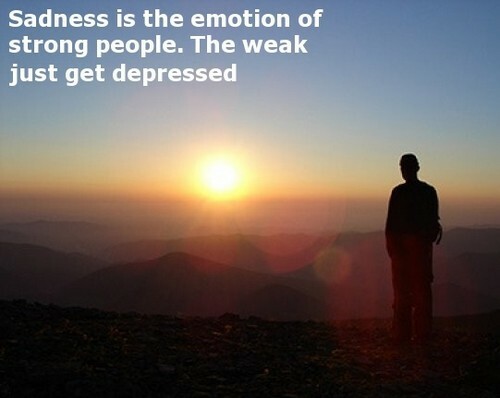 Following are some quotes, lines, and messages about sadness in life. Life is not fair, and life does not care. When life beats you hard, it is fine to feel sad, or hurt, but it is never okay to give up. Take control of your life and when you fall, mourn all you want, but when you stand again, make sure that you stand even taller, and with deeper roots. You are the boss of your life, and when life knocks you down, do not feel bad about it, tell life who is the boss and take control of it. You are the only one who can improve his life. No one else is going to do that for you, and that is a cold truth that you have to accept. Life does not get easier, you get tough. Time does not heal; you get used to pain. It is sad when you do not have any real goal in your life, and all you have do is pass it. Life is not meant to be passed; it is meant to be lived, to be conquered. Do not waste it; you will never get another one. Sometimes when you fail, you just feel like you are not good enough and you will never be. But just know that no one is ever not good enough, this thing you want to do, it might take time, but you WILL do it, and you WILL succeed. Just believe in yourself. As long as you are alive, there is always a second chance. Missing an opportunity does not mean that life is over. Sometimes life wants you to miss an opportunity because there is a better one in a queue. Do not feel bad when days are not going so good, just be patient and keep trying. Do not judge the destination by its path. Sometimes bumpy roads can lead to beautiful places. So when life gets hard, do not stop walking. Maybe it is just a bumpy road to a perfect life. Life is never fair; you have to make if fair for you. Getting what you want needs dedication, determination, and devise. You are never going to stop encountering hurdles, and difficulties in your life. All you have to do is learn from each and every single one of those hurdles, and use that knowledge to face the next ones. It is understandable that when you are sad, you do not feel like living anymore. Life seems like mere important thing at that time. But just know that it is all temporary, and life will get better no matter what. So do not do something you cannot take back. When you are not feeling like you can take any more of life’s bullsh*t, surround yourself with positive people, and say goodbye to the negative ones. This section of the article contains sad quotes about love and pain that will make you cry. 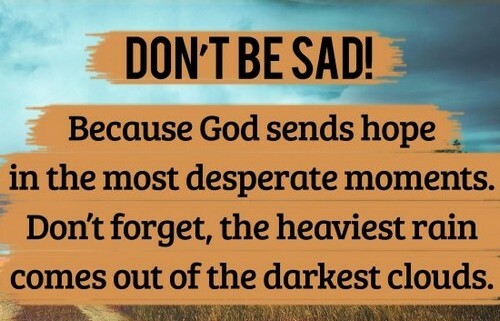 These sad sayings will also help you cope with your sadness and express it as well. I hope they help, and I hope your troubles fade away very soon. 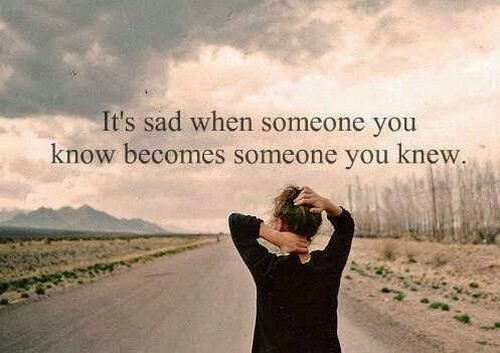 Nothing is more saddening than to see the real faces of people close to you, and not getting what you expected. It is sad that people who are very close to you are the one who hurts you the most. Maybe it is because people close to you are the only people who matter, and when betrayal comes from them, it tears you apart. When you spend a lot of time in sadness, it becomes comfortable for you, and then, whenever you are not sad, you feel incomplete. This phenomenon itself is saddening. When you are sad, it feels like nothing is ever going to be fine, but you know what, it does, it does get fine, to be honest, it gets more than fine. Your happiness is just one right decision away. When you are sad, and you cannot figure it out why, it is mainly because you are missing someone. And the sadder part is that you cannot do anything about it, you just cannot stop missing a person. There is no direct switch to perform that task. When you are sad, you just feel like shutting your brain off. But that is not possible, so instead, you sleep, you avoid the world as much as you can. Sometimes when you are sad, sudden death starts to seem like a good idea. Being sad only made me realize that sometimes life can hurt you more than death. Sometimes sadness is not real; it is made up in our heads. When you are hurt, nothing makes sense. All you think about is why? Why me? But the answer is, it is not just you, life does that to everyone. You are not alone in it. You can wear a smile on your face to hide your sadness, but your eyes can never lie. You cannot fake that sparkle in your eye, which once lived in them. I bet you cried last night, and I bet you missed him, I understand and I am here for you, no matter what. Misconceptions lead to hurt and pain. I thought I was important to you, but it turns out that I was just a fool who was being used by you. And that just makes me a sad, pathetic puppet. People often tell me to be strong in difficult times, but they leave the most important thing out, HOW?. It is not as easy as they make it seem. You have to be strong for being strong. I know you are damaged, and I know that behind that smile, you are hiding so much more. And you know what, it only makes me respect you even more, that is because it takes a lot of bravery to wear a smile when you are all broken from the inside.